We ended a previous art class by reading the book Look; Drawing the Line in Art. Each spread introduces the kids to a famous work of art and discusses how the element of line is used. I will be honest, we didn’t read every page. My little kids would have lost interest. We looked at most of the pictures and let them make observations. I used the text minimally as a spine for our discussion. This week when the kids came back we started off with another line book, this time one from my childhood. Harold and the Purple Crayon. This is a totally different take on the idea of line in artwork. This book is whimsical and fun and reminds us all that if you start with a simple line it can end up being anything you want or need. And it really just reminds me of being five years old, which is pretty awesome. The kids really responded to this book; it was obvious by the smiles on their faces. Its an oldie, but a goodie. 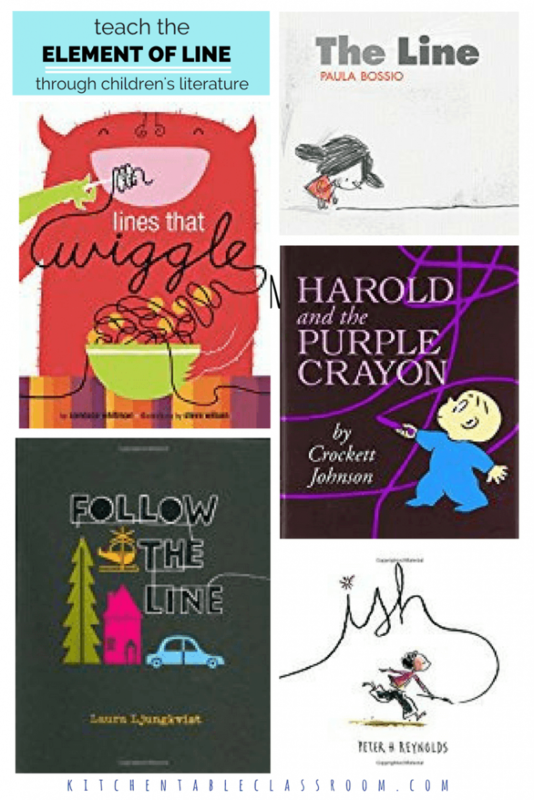 For more ideas about how to use children’s literature to teach about the elements of art check out this post! 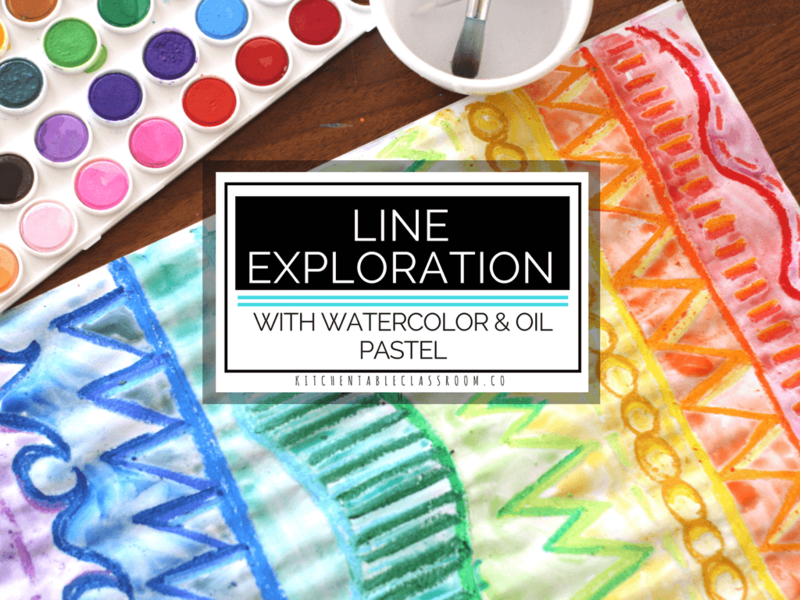 I’ve done this lesson and asked kids to pick just one color of oil pastel, just like Harold and his purple crayon. 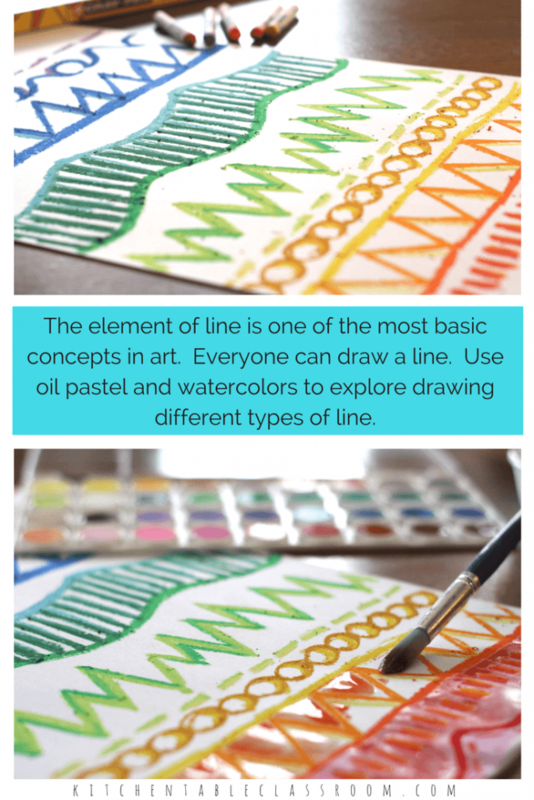 I like this idea because it allows the kids to focus on just the quality of the lines they are drawing, not choosing new colors. I’ve also done this lesson and allowed kids to pick and choose colors as they like. 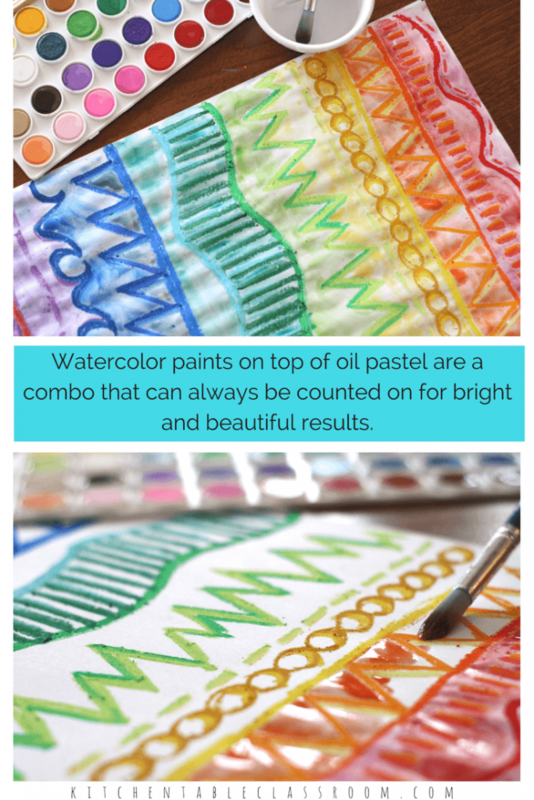 Both ways produce colorful results and teach the same basic concepts. Do what works for you and your kids. We use these Sakura oil pastels. They come in a great variety of colors and are inexpensive enough to use often and on a large scale. I don’t have to hold the kids back with these babies! Oil pastels are probably my all time most favorite art supply for kiddos. They are crazy bright, blendable, and cost as much as a cup of coffee. You will get a lot of mileage out of this package, I promise. They make my top ten art basics list -no contest! Armed with one oil pastel and a 12 x 18 paper we began by taking suggestions of kinds of line. 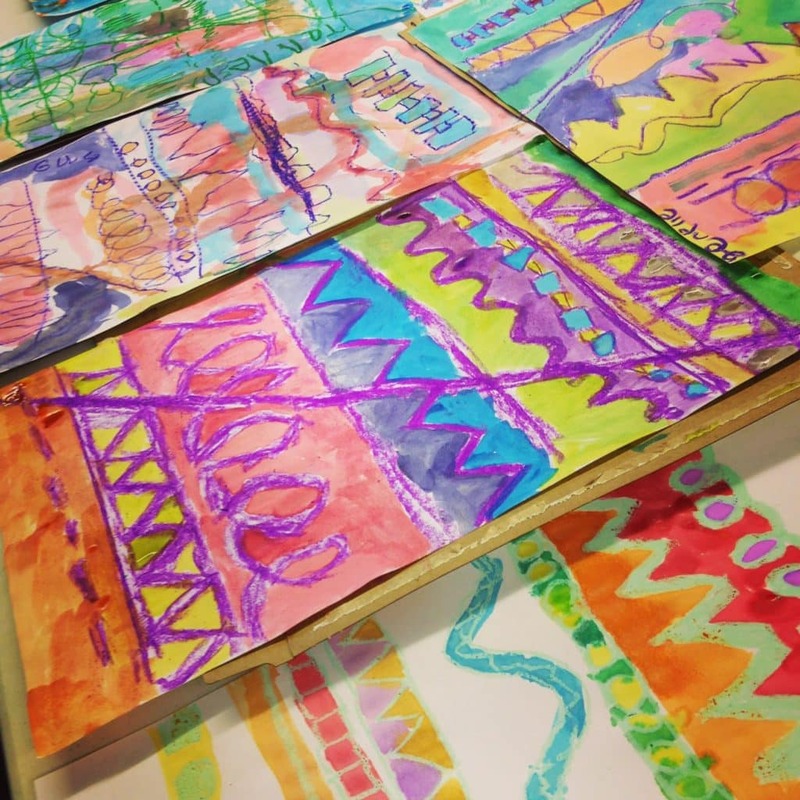 One by one we drew their suggestions; wavy lines, zig zag lines, dotted lines, & straight lines. Lines made of squares, circles and triangles were suggested and these added a nice element of pattern to their artwork. Any blank spots could be filled with a repeat of a line they had already done. When space was adequately filled they traced over their lines again to make heavy, bold lines that will really pop against the watercolor! Since we did the line exploration oil pastel portion of this project together and in a step by step fashion I wanted to give the kids some freedom in the second half of class. I like these (affiliate link) Crayola Washable Watercolors 24 count. The variety of colors is fantastic. It allows for some very sophisticated results without too much color mixing. (When we do color mixing lessons I like to pop the individual cakes of watercolor out so the kids have only what they need!) This portion of class was pretty free form. Directions were simply to fill in all shapes with color. I never present a project to younger kids with results as my intention. Little kids get the most out of the process. The making is the important part. But I do think it gives a kid a real sense of pride to have made something they are really proud of. This project accomplished both. The kids had some learning goals in mind (the introduction of the element of line) as well as plenty of space for creating their own vision! If you enjoyed this line exploration post please consider sharing it on your favorite social media channel. Every single share helps me to bring you more fun projects and free printables! Thanks Anne! Isn’t it awesome that you can find all those oldies and goodies out there!